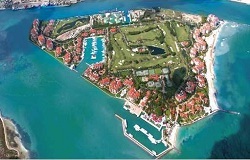 Fisher Island real estate is a private island of luxury condos and villas just off of Miami Beach. Accessible only by ferry, helicopter, sea plane or boat, Fisher Island residents enjoy private beaches, championship golf course, tennis center, deep-water marinas, several restaurants, shops, hotel, spa, Vanderbilt mansion clubhouse and private day school. Most Fisher Island condos and villas are located around the perimeter of the island with amazing waterfront and sunset views. Contact us for more information about Fisher Island real estate. Thinking About Buying or Selling in Fisher Island? Nobody knows Fisher Island and Miami Beach real estate better than The Jo-Ann Forster Team, your trusted Fisher Island Realtor. We have been successfully selling real estate in South Florida for over 30 years and have a proven track record for delivering exceptional service and results for our clients. Give us a call today at 305-468-4558 or use the form below to contact us by email and let us know how we can help you.